WASHINGTON (JTA) — Alan Gross was imprisoned while trying to connect Cuba’s isolated Jewish community to the wider world. The deal that got him released five years later may do just that and much more. Gross’ flight home to suburban Washington Wednesday, Dec. 17, with his wife, Judy, was part of a historic deal that overturns over five decades of U.S. policy isolating the Communist island nation helmed by the Castro brothers. “We will end an outdated approach that for decades has failed to advance our interests and instead we will begin to normalize relations between our two countries,” President Obama said in announcing Gross’ release and radical changes in U.S. Cuba policy. 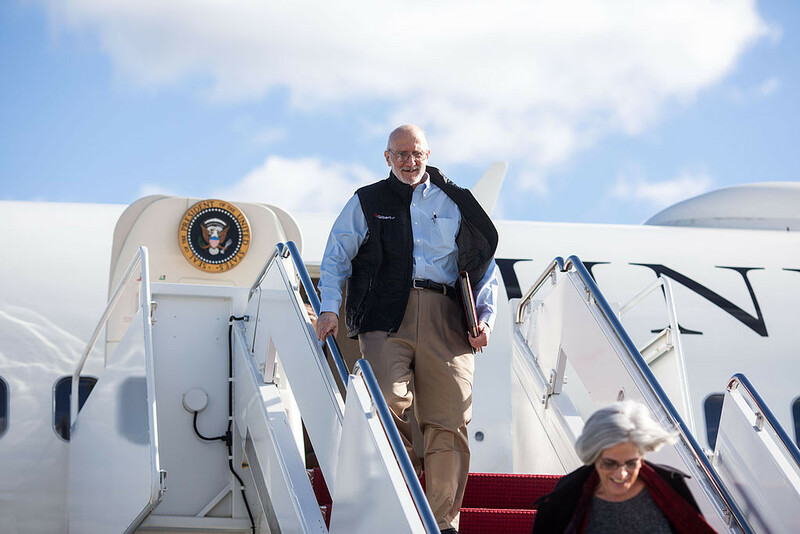 Jewish-American aid worker Alan Gross arrives at the Joint Base Andrews military facility in Maryland Dec. 17, 2014, the day he was freed after spending five years as a prisoner in Cuba. | Photo: White House photo by Lawrence Jackson. Gross, who is now 65, was arrested in 2009 after setting up Internet access for the Cuban Jewish community while working as a contractor for the U.S. Agency for International Development. Never formally charged with espionage, Gross was convicted in 2009 for “crimes against the state.” He is the brother of Bonnie Rubinstein of Plano. Back in the United States Wednesday, Gross held a news conference, which he began with the greeting “Chag sameach,” noting that his release coincided with the first day of Hanukkah. He thanked political leaders, the Washington Jewish community, the local Jewish Community Relations Council and other faith groups that pressed for his release. “But ultimately — ultimately — the decision to arrange for and secure my release was made in the Oval Office,”said Gross, reserving special praise for President Obama and his National Security Council. The official, however, also noted the significance of the Jewish holiday season of freedom. “We believe that Alan was wrongfully imprisoned and overjoyed that Alan will be reunited with his family in this holiday season of Hanukkah,” the official said. Bonnie Rubinstein said she is grateful that the local Jewish community never let her brother slip from their thoughts and prayers. “We are thrilled that Alan is home and in good spirits minus a few teeth,” she wrote to the TJP in an email. “All his health issues will be addressed in good time. Now he needs to readjust to his new and much improved life. “It is wonderful to call and speak with him whenever, I want. Today, he discovered Face Time! Of course, my only regret and great sadness is that our mother did not get to see him or give him a hug,” she added.